The plan of the Ethiopian government to launch a military invasion of South Sudan is a challenge to both Egypt and Uganda. Why is that? That is because Ethiopia wants to flex its muscles in an attempt to approve its status of being the only regional power of East Africa. What is worse than that is the degree of chaos and consequences of that action. It is risky to all the nations in the region. The military intervention of the Ethiopian government in South Sudan will trigger a regional war in East Africa. That cannot be allowed because it will be so disastrous for all the nations of the East and northeastern Africa. In fact, regime change in South Sudan means regime change in Uganda, Egypt, and Kenya and a total isolation of Eritrea in the region. We know the Ethiopian government is working harder to invade South Sudan. The move is dangerous to the country like Egypt that needs its only regional friend and ally, South Sudan. The Ethiopian military intervention in South Sudan is a threat to the Egyptian interest in the region. When Ethiopia with the help of the Troika installed a president of their choice into the leadership of South Sudan, Egypt will be left without any ally in the region because Sudan is now under the control by the Muslim Brothers. That will weaken the position of Egypt to challenge Ethiopia military because Sudan will not cooperate with the current Egyptian government. It is the interest of Egypt to not let the Ethiopian government change the political momentum in South Sudan. Another country that will be at risk of eruption of a civil conflict is Uganda. President Museveni government will be at risk of LRA if the Ethiopian government a person of their interest in South Sudan. The peace and stability will be disturbed in Kenya. The Kenyan government will face a serious internal rebellion because the destruction of South Sudan will let the resistance group of Kenya finds a haven. That will allow Odinga supporters to form armed movement. I repeat, it is so dangerous to attempt any military invasion on South Sudan. Also, the Federation of the Ethiopian will face a serious conflict as well. 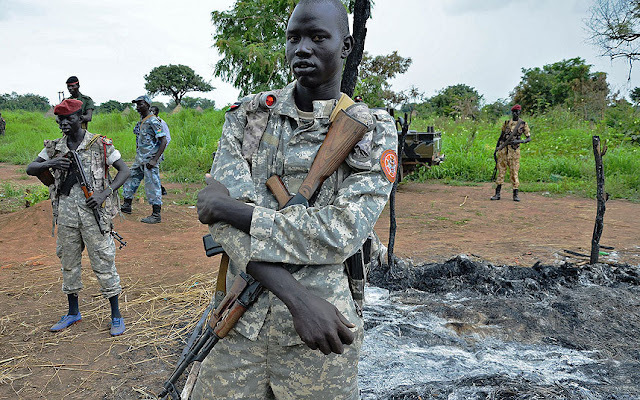 The allies of South Sudan will have no choice except to armed the Oromian Resistance Army to slow down the Ethiopian military invasion of South Sudan. Rwanda must think twice because any political changes in the region will provide the Hutu rebels a room to return. That is not okay for Burundi either. Can Eritrea Allow Ethiopia to shape the region? That should be a no if Eritrea wants to remain peaceful in the area. If the Ethiopian government is able to have political control over South Sudan and Sudan, Eritrea will be totally isolated from the region. Therefore, the Eritrean government must block the plan to invade South Sudan, it is against its national interest and will weaken it in the region which means it will be an easy target for the Ethiopian regime. What should the leaders in Uganda, Egypt, Tanzania, Burundi and Congo do? They must block it and warn the Ethiopian government to not attempt any military intervention in the South Sudanese conflict. The better solution for that problem is a political settlement which is putting pressure on the SPLM-IO leader to commit to the implementation of the peace agreement he signed. The region cannot afford to have a war.